Growing up I've pretty much always had long hair, except for a short amount of time in middle school where I looked like a long lost member of The Beatles (call me, Sir Paul! ), and it's kind of been like a trademark feature of who I am. It's not even just long hair, but very thick and curly hair, which are two combinations that are not at all enviable for a multitude of reasons. Add that it's also color treated and can get quite oily, and you have a very high maintenance head of hair. I've had to make it a point to get quality products since my hair really needs a lot of care, like using Olaplex (lifesaver for chemically treated blondes), and investing in hair tools that cause less amount of damage to hair (my hair is fried as it is). I find that because my hair is so thick, it takes a specific type of product to really be able to work with it successfully and keep the styling. I stopped using straight irons a while ago after my trusty one broke, and have relied on blow drying straight my hair (really taking care of two things at once, since everything takes forever to do). I really thought that I wouldn't ever get another straight iron again. 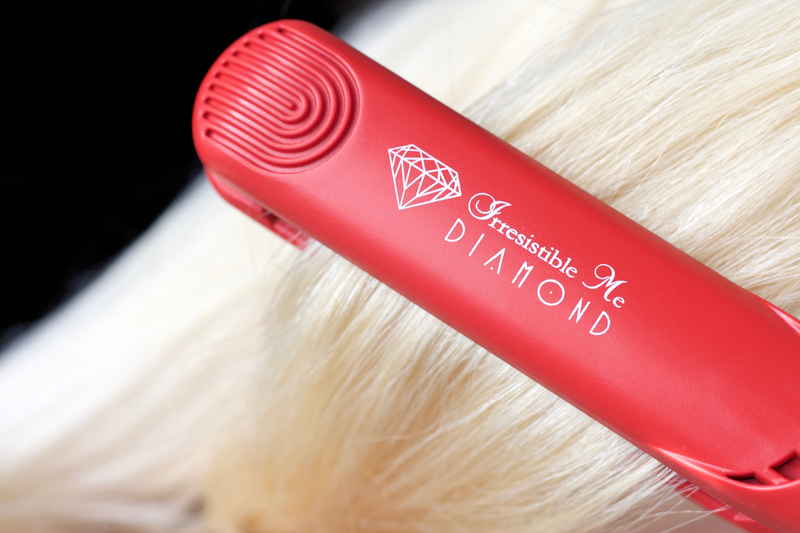 However, I was contacted by an Irresistible Me rep recently to try out their Diamond Ceramic Hair Styling Iron* and have been so blown away by how well it's worked for me. If there's one thing to know about me, when I do on the off chance say something's worked for my hair, you honestly know it's good. I rarely talk about hair care/products but after using this for over a month now I've literally been telling everybody about it. Today I thought I would finally get around to sharing it with all of you! 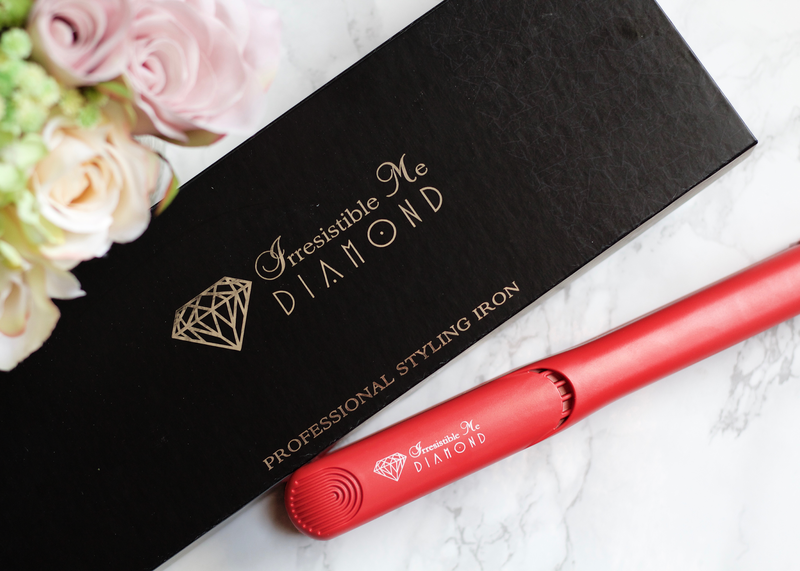 Irresistible Me Diamond Ceramic Hair Styling Iron is a floating ceramic plated hair iron coated in diamond crusted particles, enhancing its durability and heat transfer, and also includes tourmaline mixed in with the diamond coating. 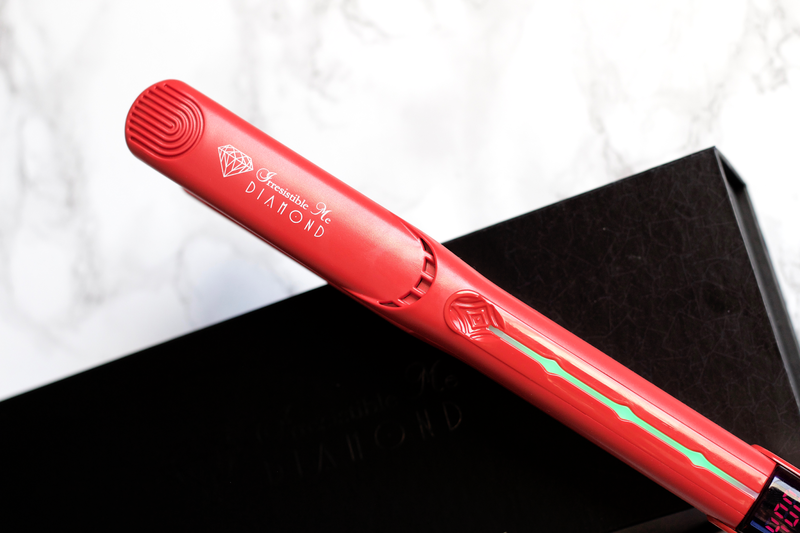 The Diamond Iron uses floating ceramic plates, which means they are able to move and get closer in contact by compressing the hair effectively without tugging/pulling out hair. You will not feel any tugging because the floating plate mechanism releases pressure if there is any excessive force put into clamping strands of hair (bye-bye to those pesky indents when you clamp too hard on your hair using a fixed plate iron). 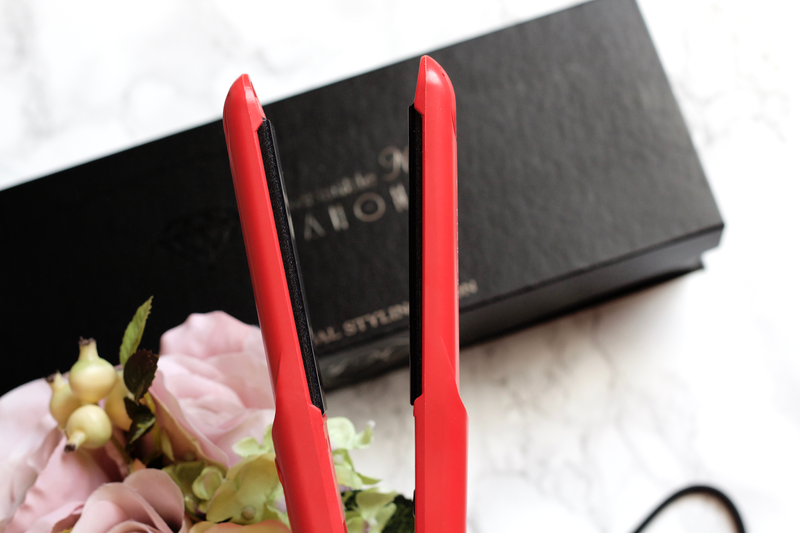 You may need to go over the same spot a few times, depending, but it's all worth it for how efficient this straightening iron is in being part of creating smooth textured hair. The mineral tourmaline is especially important, as it helps provide even heating and a smooth surface, and with its mass quantities of negative ions it neutralizes the positive ions that are prevalent in damaged/dry hair. In effect it creates that shiny, soft texture and gets rid of excessive frizz, along with sealing in the hair's natural moisture. The negative ions that come from the crushed tourmaline seal the cuticle, hair's most outer layer and active defense against damage to the hair's inner structure, and by that creates strong, smooth hair. Tools that use tourmaline are guaranteeing a quick hair styling, as you don't need as much heat to achieve what you want due to the infrared heat that penetrates the cortex (the middle, thick second layer of the hair shaft that accommodates the melanin, texture, and strength of hair); basically heating the hair from the inside, rather than from the outside. It also makes it so it will not overheat at any time, which is a safety net for any pet owners or if you have any kids. Here you can easily see the floating plate system that makes this iron so effective to use. 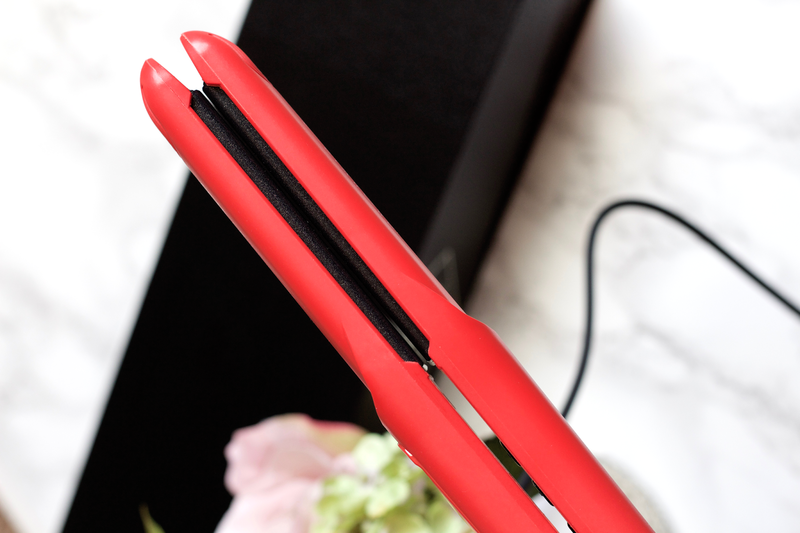 There are some amazing features to this straightener, not only in how lightweight, easy to use, and fast it is to heat up, but taking into account how much thought was put into its structure. The straightener's cord is attached at the bottom of the iron and given a 360° spin mechanism that is flexible to your position, which I really appreciate a lot as I'm so sick of cords getting in the way. It also has a great display that lights up depending what level of heat that you're at, with the control panel buttons of the iron found inside instead of outside. Such a great thing as I always got so frustrated when I would accidentally hit the settings on the sides of straighteners! Included as well is auto shut off within 30 minutes, firm gripping points so it's easy to hold and control easily (very helpful for clumsy people like me who often accidentally burn a finger or two! ), gets to 450F/230C (which is a great high temperature for those with thick hair like me), heat resistant venting holes, and a heat resistant cover. Irresistible Me notes that it has turbo heat boosting, which means that each time your hair passes through the plates the temperature goes down -40°F. 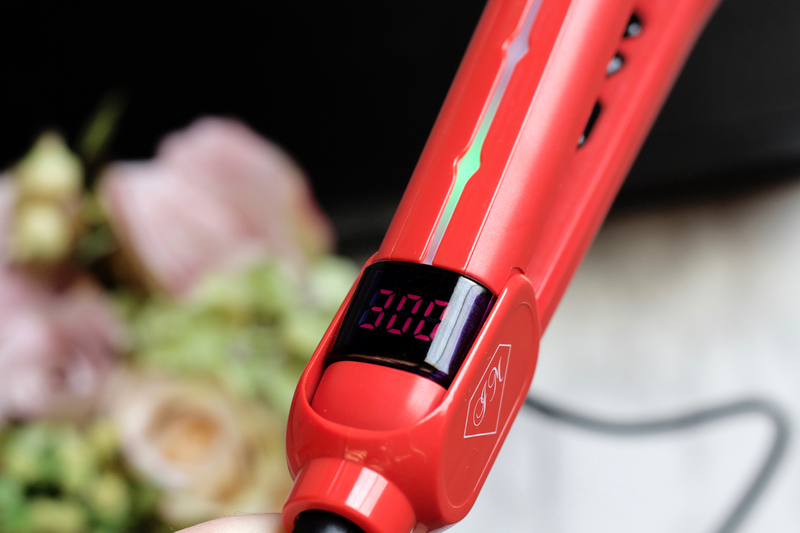 It's supposed to reduce the time needed to return to the optimal temperature to almost reach zero, and "maintaining constant temperature throughout the styling session is a crucial aspect of a styling iron's performance." I think this is a great mechanism that IM implemented, makes sense in both understanding the performance of the iron and also for helping create the silky-smooth texture of the hair since it doesn't use such a high heat. As I explained a few paragraphs above, the floating ceramic plates have a very efficient mechanism, that in this way supports the turbo heat boosting. 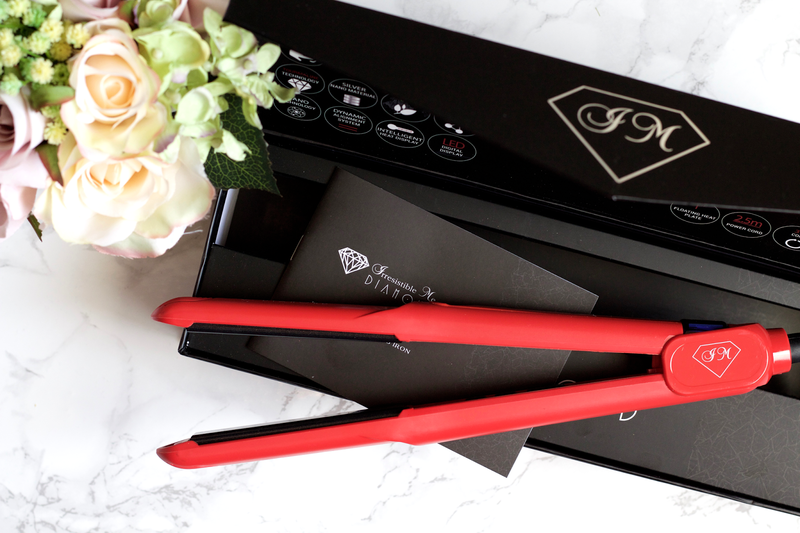 It came packaged in a really lovely designed box that is great for storing the straightener, as well with a how-to mini-booklet and imprinted quick facts about the straightener right onto the box. The presentation is quite impressive and I really love how sleek the packaging is, and how the straightener itself looks. The red color is so striking and vibrant. The control panel buttons are all found inside, instead of outside. You don't have to push them very hard, just a few clicks. The green light goes up and up as you go higher in temperature. I appreciate the clarity of the number display. 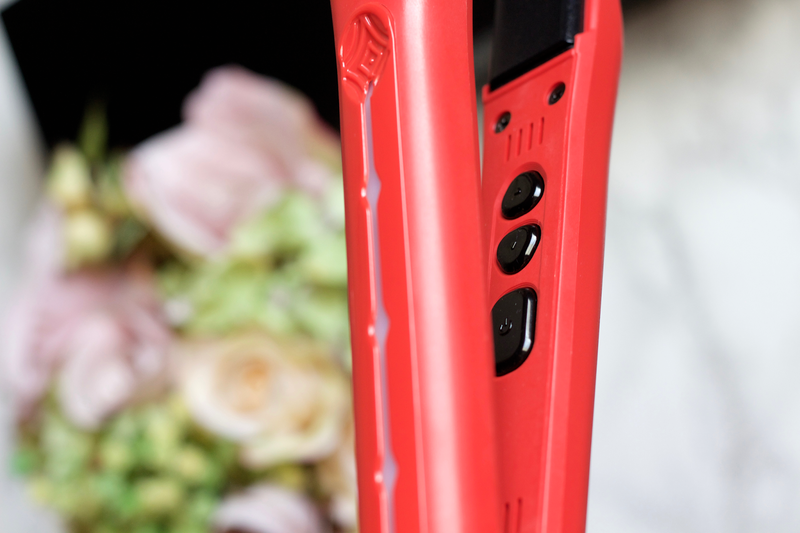 As I said in my opening, I really have been impressed by this straightener. The things I appreciate the most is how light it is and how it really creates such silky, soft texture of my hair. I have for so long wanted shiny and soft hair like I've often seen people with thin hair have, but instead mine is just thick, heavy, and mostly not even straight all the way when I try to work with it (which I've pretty much accepted with having naturally wavy hair). Even with trying to use hair oils, sprays, etc, I could not mimic the silky shine I would see in thin hair. A few times after using this straightener, I swear I've been able to get such soft silkiness I thought I never would with my hair. I have not been using any special supplement products (besides heat protectant ones), I've simply just brushed it out and used this right on it, and pretty much the whole day it holds that same texture. I've also been using it to create some relaxed curls, which don't hold significantly as I didn't expect them to (thick hair and all, I really have to use specialized curling tools that I already own for that), but they look so lovely and the ease by using the flat iron to create them has been so enjoyable. Straightened hair usually never holds the next day for me, I end up coming back to square one, but it held more than I originally thought it would and it was super easy to just fix up parts that loosened into wavy strands. The amount of time it takes to style my hair with this is at least shorter than what I used to have to deal with, and for that I'm so thankful. I have to say that the anti-tugging of the straightener has been such a huge positive for me, as I have so much hair that tends to just shed everywhere and easily gets stuck on things, and without that it would have ruined a lot of the experience for me. I think what a lot of people will appreciate about this straightener that I really enjoy is that it doesn't create lackluster straightened hair. It still keeps the hair's moisture and volume while doing what it's supposed to. I think it adds more volume to your hair to an extent, which is an extra positive from me. I like how it straightens and styles my hair how I'd like it to be, not perfectly put together but still have strands of hair poking out here and there. I whole heartedly recommend trying this straightener out, regardless of your hair type! I would be interested to hear thoughts on their other hair tools too and how they compare to this. I should note Irresistible Me has free international shipping over $150 and at the moment it looks like they are having a back to school sale, so you could get 20% off this product (since you have to buy $150 to get 25% off, you would have to at least get another product to get that 5%). If you are in the USA, this product would be $129.15 instead of $149 if you buy it during their back to school sale. What is your favorite way to style your hair--straighten or curl it? Do you have any favorite styling products? *This product has been PR gifted. See my disclaimer for more information.